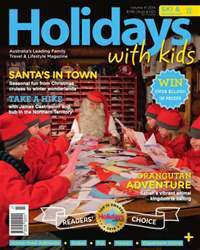 Welcome to the spring edition of Holidays with Kids, packed with a number of extra special inclusions. We announce which resorts around the world have come out victorious in our 2014 Readers’ Choice Awards; and help you get into the upcoming festive spirit with a range of magical Christmas experiences, seasonal cruises and even more giveaway goodies than normal. You’ll also find a bumper 34 pages on family skiing in the Northern Hemisphere. On top of all this we bring you some horse-centred antics from Adelaide, dispel some of the common myths of cruising with kids, follow famed adventurer James Castrission on a trek with his wife and bub through the Northern Territory’s Jatbula Trail, take a drive along Australia’s beautiful south coast and more. Further afield, our writers bring you stories from all corners of the globe: animal escapades in Sabah, sunshine and smiles from Samoa, the diversity of Dubai, Disneyland with teenagers, the inside scoop on Bali (from the mouths of kids) and a roundup of all that’s on offer in Fiji... the list goes on.